However, if you are at a place on your financial journey where you are still trying to hit that debt free threshold, then Stitch Fix might not be the best option. Keep working on eliminating debt. I am confident that soon you to can reach your goals! While Barry and I were working to pay off our debt, we did not have room in our budget for much of anything other than the basics. I was thrift shopping pretty much exclusively and not spending hardly anything on clothes. We definitely didn’t have any extra income in our budget for new clothes. But now that we have paid off our debt, we have more disposable income. In addition to buying more interesting and expensive food, Barry and I decided that we wanted to spend some of our extra income on nicer clothing. I had never bought myself a pair of nice shoes until a couple years ago. People have always told me that if you can afford to pay more for new, higher quality shoes and clothing, they will last longer. I didn’t believe them. But now I know that is true because I have experienced it myself. Several years ago, I purchased a very nice pair of brand new boots. Y’all, they have held up so well and I know they are going to last a lot longer than any of my other pairs. Like I said, they are several years old…and they’re still going strong. Do not feel guilty for achieving financial freedom! I had to remind myself this a lot. Initially I did I feel oddly guilty that by spending money on something as “frivolous” as clothes, I was being wasteful. But I have realized that it is okay to spend money once you are living debt-free. Be proud when you have paid off your debt. And having extra income to spend is a gift that Barry and I are so grateful for and want to spend wisely. When I first realized I had extra money to spend on new clothes, I didn’t even know how or where to shop! First, I tried all the online thrift shops like Thred-Up and Swap. Then, I bought from Amazon.com. Sometimes, I was just throwing away money because I had no skills in how to put outfits together or buy clothes that work well together. I am seriously wardrobe challenged! With the public speaking we do, church, Bible study, errands, etc., I always want to look put together when I am out in public. Sadly, I never knew what to wear or what makes a good outfit. Stitch Fix saves me, y’all!! I had heard a lot of mixed reviews about whether or not people felt like it was worth it. As I said, I realize it is not for everybody because of budget concerns. However, in my personal experience, it has been so helpful and totally worth it! I do not like shopping for clothes. Not only did I have a hard time putting things together, but I would also play it safe and stick to the exact same thing over and over again because I thought it worked. Now, with Stitch Fix, I don’t have to go out shopping to find outfits and sizes, etc. All I did was fill out a questionnaire, send them a link to my Pinterest board, and viola! A box picked just for me arrived at my door a few days later. No more trying on clothes in a dressing room. No more dragging my kids with me to the store. I take my box into the privacy of my bedroom with my lights and my mirror and try everything on. I will add that based on my shopping experiences at Target, Old Navy, etc., Stitch Fix might be a little bit more expensive, but not by much! In one box, I got an amazing jean jacket from Stitch Fix for $35 – and I know you’d pay at least $20 for a decent jean jacket at Target. I love that Stitch Fix gives you pieces that you can mix and match! They never send you a piece in the box that cannot be paired with other pieces to make different outfits. 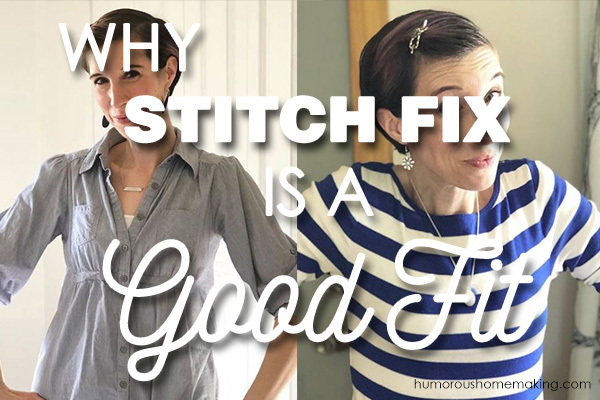 I don’t get a Stitch Fix every month – definitely not all year long. I just do it a few times a year – when the seasons change. For some reason, I especially hate buying and wearing winter clothes. Something about layers and thick sweaters makes me feel like a snowman. I put on a quilted vest and I feel like I’m headed to the North Pole. No good, y’all. But even in winter, Stitch Fix manages to find pieces that totally work for me and boost my confidence! What else should you know about Stitch Fix? I love that it’s free shipping – both ways. Even if you make an exchange for a different size – shipping is ALWAYS free. They send one of those pre-paid mailing envelopes with every shipment so returns are easy. It only costs $20 to get handpicked pieces & expert styling advice that is 100 times better than whatever I could do on my own. Bonus, they waive that fee and apply it toward anything you buy if you do decide to make a purchase. I love their “Buy All” Discount. If you buy all the pieces they send in a box, you get 25% off your box at checkout! When I divided everything out, I did not feel like the pricing per item was actually too expensive. Which reminds me of another thing I want to mention…Stitch Fix Resale groups on Facebook! Say you keep all the pieces in your box to get the discount, but there’s a shirt you don’t really love. Search Facebook for Stitch Fix Re-sale groups. Once you join these groups, you can sell the one or two items that you don’t want from your box in the resale group. You still get the discount for the items you love, but aren’t stuck with anything you don’t really want. Win-win!Last thing – if you shop using my referral link, you get $25 off your first order. That’s right – $25 off. So basically, you’re almost getting a free shirt! 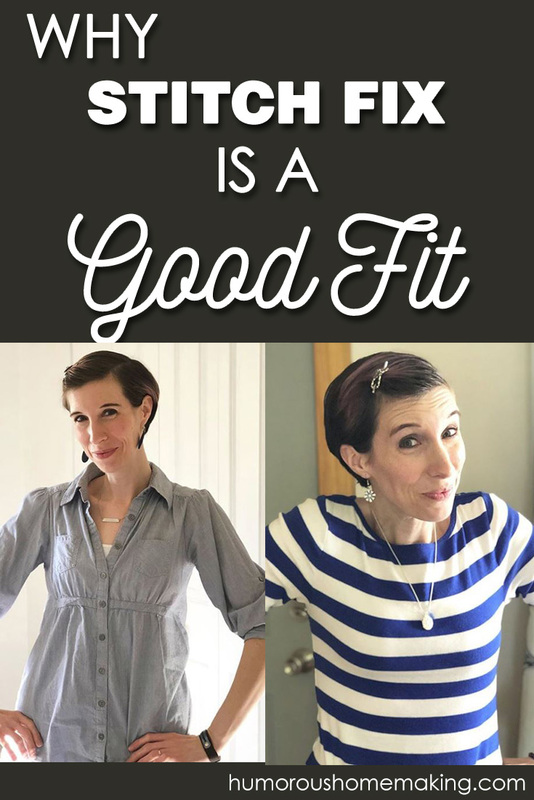 As I said in the early part of this post, if you are in a place in your life where Stitch Fix fits in your budget, I encourage you to give it a try! If you have tried it before, what did you think?